Eating the right foods after a workout can speed your recovery and improve your energy levels for your next workout. 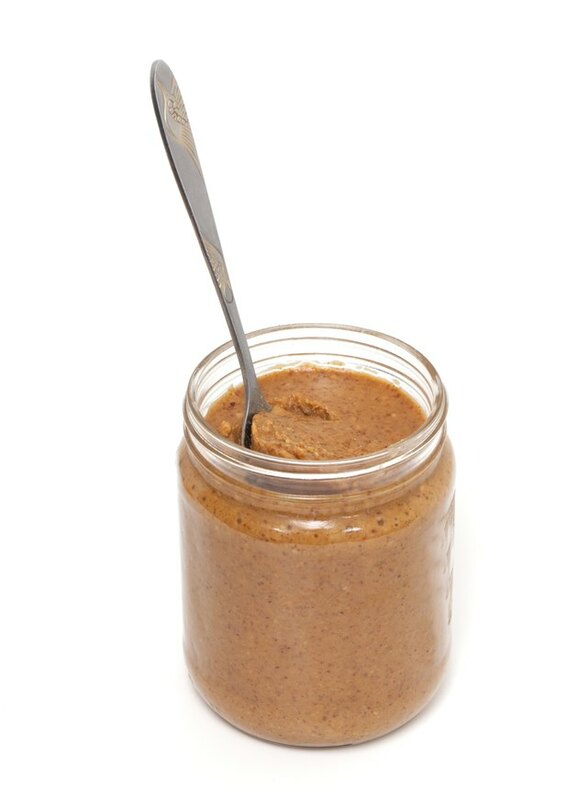 Peanut butter is a convenient, versatile choice that can be a component of a nutritious, post-workout snack or meal. Eat it with other nutrient-dense foods, and choose all-natural peanut butter to avoid cholesterol-raising trans fats from partially hydrogenated oils. A 2-tablespoon serving of peanut butter provides 6 grams of carbohydrates and 8 grams of protein. By including up to 20 grams of protein after your workout, you will maximize muscle repair and recovery, according to Iowa State University Extension and Outreach. Consume 100 to 200 grams of carbohydrates to replenish your stores of glycogen, which is the form of carbohydrate that your body stores for fuel. To hit this target, spread 2 tablespoons of peanut butter on a large bagel, which has 66 grams of carbs and 13 grams of protein, and complete your post-workout meal with a large apple, with 31 grams of carbs. A smaller snack containing carbohydrates, protein and fat within 30 minutes of finishing your workout can promote muscle synthesis and restore glycogen stores. You can carry peanut butter in your gym bag or store it in a locker so that you can access it easily after working out. For a quick, nutritious snack, have peanut butter with a banana, rice cakes or whole-wheat pretzels. Drink plenty of fluid after you exercise to replace the fluid you lose from sweating. Having peanut butter after a workout can benefit you because of its fat content. A 2-tablespoon serving provides 16 grams of fat, including 7.7 grams of monounsaturated fat and only 3.4 grams of saturated fat. Monounsaturated fat can lower cholesterol, while saturated fat can raise your cholesterol levels and increase your risk for heart disease. Fat is an essential nutrient for helping your body absorb vitamins A, D, E and K, but you should not consume high-fat foods before working out because they can lead to an upset stomach. Having peanut butter after working out can help you meet your fat requirements. An active adult on a 2,000-calorie diet should consume 45 to 78 grams of fat per day. Another nutrient in peanut butter that can benefit you is vitamin E. Each 2-tablespoon serving of peanut butter provides 2.9 milligrams of vitamin E. This is equivalent to 4.4 international units of vitamin E, or 15 percent of the daily value based on a 2,000-calorie diet. Vitamin E is an antioxidant that can help reduce cellular damage caused by oxidants, the levels of which are higher after you work out. Can You Lose Fat in Your Feet? Can You Get Vitamin B12 Anemia If You Had Your Gallbladder Removed? Is Butter on the Glycemic Index?